I just read Tayari Jones for the first time earlier this year. I had been wanting to read Silver Sparrow for quite a while and finally got around to it, coincidentally, right around the time her newest novel was released. 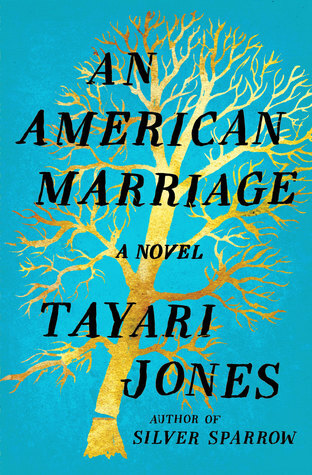 I loved how Jones wrote about her characters and their relationships so I was eager to try An American Marriage. Plus, who wouldn't be enticed by that gorgeous cover? The marriage is between Celestial and Roy, who have only been married for a short time when Roy is arrested for a crime they both know he didn't commit. He is sentenced to twelve years in prison. While he is gone, Celestial continues building her artistic career making realistic dolls she calls poupées. But the length of his incarceration may be too much on a fledgling marriage, despite how much Roy and Celestial clearly care for each other. Chapters alternate viewpoints between the two characters, joined later by chapters from the perspective of Celestial's long-time friend Andre. I loved the characters in this book, how realistic and flawed they were and how painful it was to see the strain on their relationship. Worse was the fact that it was so unnecessary, Roy having been falsely accused of this crime. His life had been going so well, and I don't have to explain what a setback prison is to someone just getting started on a career and marriage. Both Celestial and Roy had promising futures and were hoping to start a family and it was incredibly painful to see it all come tumbling down. Celestial was an independent and strong woman, and Roy appreciated that about her. I remember thinking at one point while reading that none of the men in this book deserved her, but I do have to say that Roy was actually a really good guy. Several times he reflected on his behavior toward Celestial and admitted that he should have acted a different way. He owns up to his mistakes and honestly sets a pretty high bar for himself. Some of this comes through in conversations he has with his biological father, who he coincidentally meets in prison, and some is just through his own thoughts. Jones's writing is straightforward and conversational, allowing the focus to be on the characters and what is happening rather than the way she is telling it. This makes it so easy to become immersed in the story, which I did as soon as I began and I easily read the whole book in just a few days. If you haven't read this author before I highly recommend giving her a try.